Many of us Android fans remember the days of HTC's dominance, and I for one would like to see them make a comeback and succeed. Sadly, based on how the U12+ was received, that's just wishful thinking. But if you want a red version, here you go. It'll cost you $799 and it ships in September, according to HTC. The PR doesn't explicitly mention how much storage the Flame Red U12+ has, but based on the price, I'm willing to bet it's the 64GB model. • Edge Sense 2: A new touch feedback experience turn the edges of U12+ into the easiest and most intuitive way to interact with your phone. The new Edge Sense knows which hand you are using, giving you one-handed freedom to double tap to navigate the device, hold to lock the screen orientation, or squeeze the sides for taking photos and videos, zooming in on maps, and virtually any interaction. • Amazing cameras: Two cameras on the front and back deliver beautifully artistic photos with DSLR-like bokeh. UltraSpeed Autofocus 2 includes full sensor phase detection autofocus and new laser autofocus to ensure you never miss your shot, while HDR Boost 2 lets you take fantastic photos in any lighting condition. The main camera’s 2x optical zoom and 10x digital zoom for photos means you are always ready for a close-up, while video with Sonic Zoom lets you “zoom in” on a sound or voice so you are truly the director of the scene. And with one-touch auto zoom, it’s almost like you have Hollywood in your pocket. • Best-ever HTC BoomSound, USonic, and Qualcomm® aptX™ HD audio: Incredible, pulse-pounding sound with louder-than-ever BoomSound speakers and USonic earbuds featuring Active Noise Cancellation to keep out unwanted distractions. USonic matches the unique structure of your ear to shape the sound perfectly for you, so you hear every high note with crystal-clear precision and every bassline with thundering power. For wireless audio that goes way beyond expectations, aptX HD is designed to support high resolution 24-bit Bluetooth audio. • Liquid Surface: The U12+ showcases an even more artistic design featuring ultra-thin screen borders and new pressure-sensitive buttons encased in vibrant colors unlike anything you’ve seen. 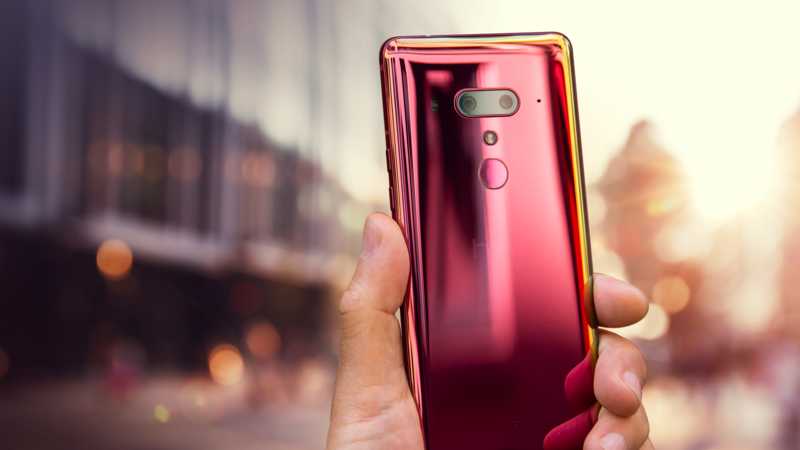 A Translucent Blue color that lets you admire your phone’s beauty both inside and out, while Ceramic Black offers a gorgeously sophisticated look and Flame Red delivers extraordinary, color-shifting hues in the most dynamic look HTC has ever created. • Power and performance: Equipped with the Qualcomm® Snapdragon™ 845 Mobile Platform with X20 LTE that will extend the way people see, hear, and interact with the world around them. It is engineered to shatter performance expectations and connect you at beyond Gigabit LTE download speeds without unnecessarily compromising battery life. With 6GB RAM standard and up to 128GB storage, the U12+ shatters expectations of the power and performance you can expect from your phone. 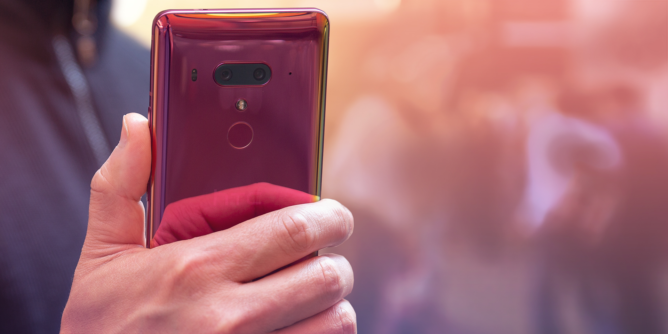 In addition to Flame Red, the HTC U12+ is also available in Translucent Blue (64GB or 128GB) and Ceramic Black. Please see htc.com for more.